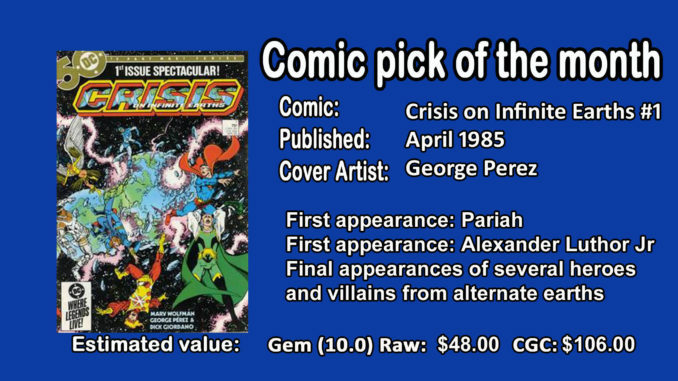 The comic pick of the month is none other that DC’s Crisis on Infinite Earths issue #1 (volume 1). Crisis on Infinite Earths is a twelve-issue limited series. It is the first DC series of its kind to be referred to as a maxi-series. The Crisis storyline ties into nearly every existing DC title published at the time. Penciled by George Perez and written by the team Marv Wolfman and Robert Greenberger, Hicollector is recommending to pickup the first issue of the series. As this is a copper issue, Hicollector recommends you pick this issue up at 9.0 or greater.